I never thought I’d qualify for a residency. “I’m a marketer, not an artist,” I thought. But I was accepted for two this year: a week at The Growlery in San Francisco and a month at The Sanctuary in Arcata, California. Both of which I found in Piney Wood Atlas. Alicia Toldi, co-founder of Piney Wood Atlas, describes creative residencies as “space and time for artists to create their work.” They’re an under-utilized opportunity for all creatives, beyond just the traditional definition of an artist. More specifically, residencies are typically free or low-cost housing for a designated period of time designed for people with creative work to focus on. The duration, environment, discipline, and living quarters differ between each. Some also offer a stipend or scholarship. When I interviewed Alicia and her co-founder, Carolina Porras, for The Process Podcast, they expressed how open residencies are to a variety of creatives. Yes, they’re typically open to painters, sculptors, authors, ceramicists, and photographers. But they’re also open to chefs focusing on their culinary pursuits or researchers finishing papers. Each residency founder has their own unique mission. Most are artists with spare space who empathize with the working artist struggle and want to give others a place to create. Some want a way to create more art for their local community. Below, you’ll find a breakdown of different types of residencies, how they’re funded, and how you can fund your own work. First, here’s why a residency might be a great fit for your work. Residencies offer free living quarters, studio space, and dedicated time to focus on your creative endeavor(s) of choice. The dream, right? But the biggest benefit, in my opinion, is the perspective they offer, which comes in many forms. Surrounding yourself with new scenery, people, and tools gets the creative juices flowing. A new physical environment alone sparks inspiration. Residencies also offer new people to bounce ideas off of and learning opportunities galore. You’ll undoubtedly find inspiration through other people’s work or the history of the place you’re in. Not into meeting new people? That’s OK! If you’d rather hang in nature surrounded only by mountains (or farm land or ocean) and wildlife, there are programs designed for you. If it’s quiet and alone time you seek, refine your search to rural residencies. According to research from Harvard, learning a new skill can slow cognitive aging. Many residencies provide an opportunity to broaden your skill set with pottery, screen printing, woodworking, music, etc. That’s what drew me to the program I join in May, The Sanctuary. Their bottom floor is a playground for makers with open studio hours every Saturday. There are also plenty of opportunities to create your own time for self-care within residencies that don’t offer specific programming around it. Much like international travel, residencies are an opportunity for personal growth outside of your comfort zone. For example, the Sanctuary is one of several programs encouraging residents to host their own (paid) workshops to the community. It’s a little scary, but I hope to develop a workshop model while there that I can then offer to clients. Most residencies have an in-depth application process. They’ll make you think about the purpose and goals of your work. They’ll push you to set objectives and deadlines for your work. They’ll also make you take a step back and remind you what and why you set to achieve in the first place. Think of your residency experience like a create your own adventure game. You can design it for your optimal creativity. According to the Alliance for Artists Communities, there are an estimated 500 artists’ communities in the U.S. providing $40 million in support to artists annually. There are more than 1,500 worldwide. 70% are multidisciplinary. 60% are in rural areas and small towns, while 40% are in urban areas. 90% have public programs that engage the local community. And of course, each looks different. Most residencies will want you to get involved with the community. Expect to help with open studio hours, tours, attending or giving talks at events, group dinners, and more. When applying, keep in mind that many are looking for folks who are excited to be engaged. This could mean painting a mural (like The Growlery or the En Root House Mural Residency in Chattanooga, Tennessee), writing an article on the area, or teaching fellow residents. Some nonprofit residencies are supported by grants or larger arts organizations, some by private donors and are managed by a board of directors. Others are a combination of both. Self-funded residencies take many forms. Alicia and Carolina said they’re seeing more programs sustain themselves with a hotel or bed and breakfast component. In these, some rooms are reserved for residents, others are for paying visitors. Some residencies offer a room, others an entire house, cabin, puebla, or apartment. A few offer several choices, like Elsewhere Studios in Paonia, Colorado. Others are more unconventional, like this hammock in Vancouver or this garden in Portland, Oregon. You’ll also find incredible, private cabins in places like Zion National Park in Utah or Joshua Tree National Park in California. Some residencies require rent but it’s typically very low, only covering some of their overhead costs. If rent is required, you can often apply for a stipend or grant to cover it. It’s common to work out a work-trade arrangement as well. I’ve considered offering marketing help to residencies or surrounding businesses in exchange for waived residency fees or for learning a new craft. I could see a designer, illustrator, or website developer doing the same. In terms of food, some residencies offer free meals, groceries, or access to their garden. Others ask that you fend for yourself. Logistical details such as food and transportation should be taken into consideration when deciding between a rural or city program. Creatives who need or want to be paid for their work often approach a local city, government, or private clients for commissions while at a residency. Some residencies require an application fee, usually $25-$30 to help cover administrative costs. I think of these as a way of giving back to the arts. When applying, at a minimum, be ready to provide an artist statement, statement of intent for that specific residency, and work samples. In my experience, most offer month-long programs. I’ve also seen week-long, year-long, and choose your own duration. Most residencies I’ve seen are self-directed but some offer more structure and/or mentorship. As mentioned, these programs aren’t limited to the fine arts and many are multi-disciplinary. For example, Noise Attic - a residency for audio storytellers - just launched in Lima, Peru. There’s truly something for every creative. There are a few ways to filter through all the options to find a residency that’s perfect for you. One is asking around your network of creative friends. Another is a classic Google search with your location and/or discipline criteria. Large databases of residencies where you can sort by deadline, duration, location, and discipline are popular. These include ResArtists, Alliance of Artists Communities, and Rate My Residency. There are also geographic-specific databases like Berlin Art Link and TransArtists in the Netherlands. My favorite resource is Piney Wood Atlas, which visits and catalogues new, small, and unconventional residencies. Alicia and Carolina have spent time in these spaces getting to know the managers, residents, spaces, and towns. Their books and website are beautifully illustrated with so much character too. Their end goal is to start a residency together so their passion and interest runs deep. 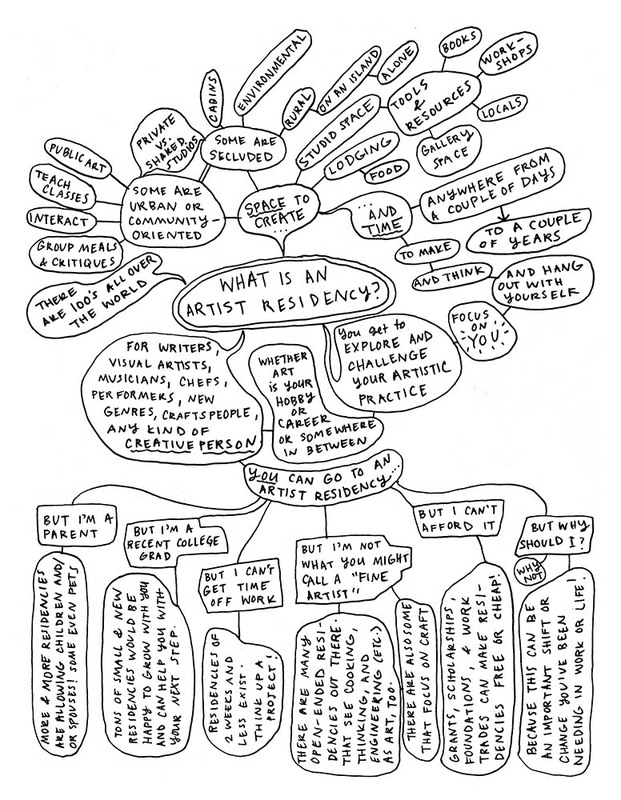 Discovering the world of residencies has been illuminating for me. There’s something for everyone, not just recent grads or someone with a novel to finish. You can even find residencies to accommodate a family if you’re unable to travel away from yours. We all deserve time and space to take a break from our everyday lives to explore a different part of our brain. Not sure what you’d work on? Browse some residencies and let your imagination wander! Shannon Byrne is a freelance writer, marketing strategist, community builder, and podcaster. She’s the founder of A Song A Day and The Process Podcast and is working on a print magazine. When not doing those things, she’s hiking, at a concert, reading, traveling, or exploring wherever she’s calling home at the moment.